Grew Up… living with his draconian father, Police Captain John Logan. The young Ted does not identify with his strict and old-fashioned father. While the police captain wants his son to live a respectable life, Ted just wants to “party on” through the rest of his high school career. Profession… high school student, but not a very good one. Interests... playing the guitar. He's the lead guitar player in the heavy metal band Wyld Stallyns. 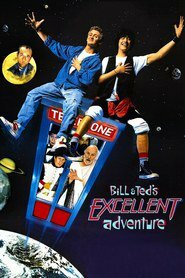 Bill and Ted, the only current members of the band, have plans to make it big one day. Ted firmly believes that their music has the power to change the world for the better. And according to Rufus, who says he’s a visitor from the future, their dream comes true. Relationship Status... single, but he and Bill meet two beautiful princesses in 15th Century England. What girl can resist a guy in a hot band? Challenge… passing his history class. If Ted doesn’t get an A+ on his next history presentation, he will flunk out of high school and be sent to a military academy in Alaska. Personality… airheaded. Ted, who tends to be more romantic than his friend Bill, has a weakness for bodacious babes. As he tells two giggling princesses: “Oh you beautiful babes from England, for whom we have travelled through time… will you go to the prom with us in San Dimas? We will have a most triumphant time.” That’s poetry right there. Ted Logan's popularity ranking on CharacTour is #2193 out of 5,000+ characters. See our top-ranked characters and read their profiles.